The "Tanner" is available here in the 1" section. I just wanted to share a little bit about Tanner with you. Tanner was supposed to be our last pup since my husband and I are getting up there (well almost 40 but we have no kids, no family, etc to take our pets when we are gone) in age. He was everything I had wanted in a pup to show and be a part of our family. Sadly we had lost 2 of our other canine family members just the year before his arrival. I've owned Brittanys my entire life and got involved in showing/training them in 1986 and rescue work around 1990 or so. So my house has always included a few Britts. 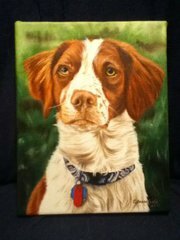 :) Tanner had just the perfect Brittany temperament. He was just a really great dog and everyone loved him. He did pretty well at shows and we had a lot of fun. Unfortunately, in 2009 just a couple months before his 4th birthday he fell very sick. After about a week of going back and forth to the vet and him not eating and spending a ton of $$$$ we finally got a diagnosis of IMHA (not sure if you have heard of this or not but you can look it up on the Internet…it's pretty bad and the prognosis is pretty poor). We finally got him back on track once he started on Prednisone. Unfortunately, every time we tried to wean him off the medication his blood count would drop. However, we were able to get him down to a fairly low dose and maintain him on that. The side effects of him constantly being thirsty/hungry/etc were not pleasant. He gained quite a bit of weight and I could tell there were times he just didn't feel all that good, but being a typical Britt he was doing okay.